Is Your Dog Itching? Is Your Dog Scratching? 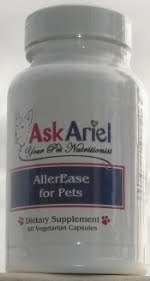 AllerEase contains two key ingredients known to help relieve allergy symptoms: Quercetin and Nettles. Together provide excellent support for pets that have environmental allergies. Use this formula to help reduce dog scratching, dog itching and overall allergic reactions to environmental allergens. AllerEase is easy and convenient to use. You can open the capsule and put directly into your dog's food. This product will help stop constant dog scratching and dog itching! Studies show that nettle leaf has anti-inflammatory properties that help with allergies. It is thought that the nettle helps prevent the body from making inflammatory chemicals known as prostaglandins. Quercetin is used for it’s anti-histamine and anti-inflammatory properties. Together these two herbs help reduce dog scratching and itching! Quercetin belongs to a class of water-soluble plant pigments called flavonoids. Quercetin acts as an antihistamine and has anti-inflammatory properties. As an antioxidant, quercetin protects LDL cholesterol (the cholesterol) from becoming damaged. A variety of evidence indicates that quercetin possesses potent antioxidant properties.